What kind of hand would you need to call a blind all-in for $1,200? @leehjones has some thoughts. When offered a chance to "flip," the decision hinges both on the math and a player's risk tolerance. After you play a lot of live poker, you think you've seen it all. That's when the universe shows you a new trick. The scene was a California $3/$5 no-limit hold'em game — I'll leave the exact location unspoken. When my tale is told, you'll understand why. I was leaning against a post, waiting for my seat, when the under-the-gun player announced that he was all in. Thing is, he hadn't received his first card — the dealer was just getting ready to pitch it to him. Dealer shrugs (they have seen it all) and tosses the all-in button in front of him. He's got about $1,200. My immediate thought was, "Wow — if I were next to act, what would I need to call?" A couple of players around the table had $1K, and UTG (aka "RandomMan") had everybody covered. It's interesting that this decision hinges on not only the math, but also on a player's risk tolerance and dollar utility. 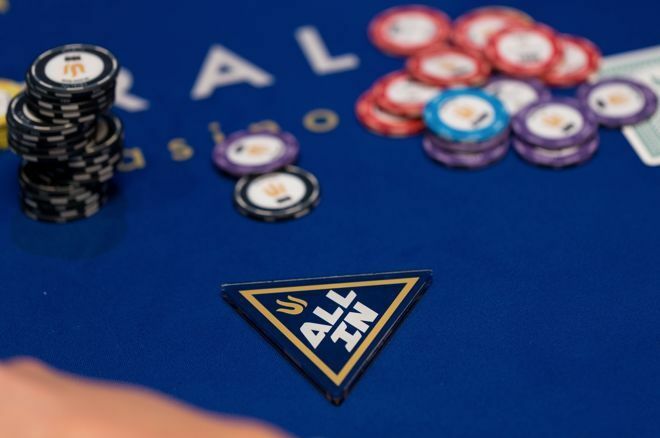 If everybody folds to me in the big blind, it's a straightforward question: "What do I need to call $1,200 all-in?" The answer is equally straightforward: "The set of hands that are +EV against two random cards." But suppose RandomMan shoves $1,200 blind and you're next to act? With what range of hands should you stick in your $1,200? You must have a stronger hand than "anything that's beating two random cards" because somebody may wake up with pocket jacks behind you and you will be stomped. I spent some time on Pro Poker Tools and found a range of hands that will do well if somebody behind you jumps in. To simplify the search, I assumed that once you called RandomMan's shove, another player would require a "top 20%" hand to get in as well. Any positive edge 3-way against RandomMan and a top 20% hand: A7s+, KTs+, QJs, ATo+, Kqo, 66+. Of course, if you stick to this range and nobody comes in behind you, you're destroying RandomMan — you'll have a 39% edge and expect to win $450 in a $2,400 heads-up pot. It's interesting that this decision hinges on not only the math, but also on a player's risk tolerance and dollar utility. If you're Warren Buffett, then the money means nothing, but passing up a positive investment is too much to bear. If that $1,200 is your "case money," as the old gamblers used to call it, then (a) why do you have that money on the table? and (b) you'd better wait for a better situation, I guess. Anyway, let's get our heads out of the spreadsheet and back to the table. When we left off, RandomMan had just shipped $1,200 from under the gun, completely blind. Halfway around the table, the tightest player in the room called for $800. I thought, "That's a top 10% hand. RandomMan is in trouble." Then one of the action players called and the rest folded. RandomMan squeezed out his hand, and discovered he had a monster — pocket nines. Tight guy had ace-queen. Board ran out clean, both tight guy and gambly guy mucked, and RandomMan scooped a $2,500 pot. This crazy scenario is not likely to happen to you, but in case it does, check in with me at www.leejones.com/contact and let me know what your decision was and how it worked out. Not 48 hours after writing "This crazy scenario is not likely to happen to you" I found myself in another $3/$5 game where a completely different guy was blind shoving $1K every other hand. I sat there thinking, "Bet I know correct calling ranges better than most here." My grinder friends tell me this behavior is more common than one might expect, so now you're prepared. If you want coaching on more mundane poker topics, Lee is the man. Check out his coaching site at leejones.com/coaching to get a free consultation and see if his coaching is right for you.